Kitwanga has a General store, gas station, restaurant, post office, public campground. 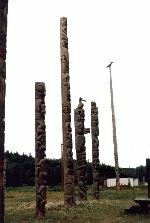 Totem poles. Early wooden Anglican mission church. Kitwanga is an Indian word meaning "place of the rabbit."